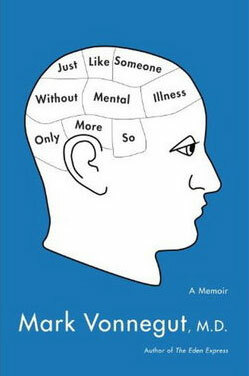 I just finished chapter nine of Mark Vonnegut, M.D.’s Just Like Someone Without Mental Illness Only Moreso. Vonnegut’s memoir is the pleasure-to-read story of a 60-something-year-old man with mental illness, with a family, with a home, with a medical degree and practice. Chapter nine is called “Crack-up Number Four” and contains the part of the story wherein Vonnegut relapses after fourteen years of working things out and getting by. That’s an understatement, of course. During those fourteen years, he started that family, bought that home, acquired that medical degree, and went into that practice. As it goes, he was swaddled in a straight jacket and taken to the hospital where he once studied and now worked and taught. “And if you’re lucky enough to survive going crazy and get back to the point where you can pass for normal, it builds a question into the rest of your life. You have to forgive people for wondering, ‘How all right can he be? '” (8). “It’s like an apocalyptic disintegration sequence that might be useful if the world really is ending, but if the world is not ending, you just end up in a nuthouse. If we’re lucky enough to get better, we have to deal with people who seem unaware of our heroism and who treat us as if we are just mentally ill” (16). “As soon as someone who has been crazy can pass for normal, he is offered a witness relocation program with a new diagnosis and a new childhood if necessary” (46). The truth is that none of us are completely “closeted.” Someone knows, and typically there are more than one Someones. Usually, family and some friends. Different families and different friends react differently to this. Some are fans of overprotection, some are fans of denial, some are fans of constructive support by way of being there without coddling. I personally have a very hard time forgiving people for the “How all right can [she] be?” question, especially those who are, by definition, unaware of what I’ve gone through, of my commitment to being all right, of the work I put into it. I pride myself on being trustworthy, and I see in that question that others don’t fully trust me. Or they trust me, but not my diagnosis. Having that trust, from myself and others, is an important metric for how I’m doing at the whole being-a-real-person-in-the-real-world thing. And short of taking up the witness relocation offer in a completely literal way, I’m not sure how or if I’m going to get that trust from some of the people who know and saw my history. So, Question: When you know you are more or less fine, is it all that important that people believe you? “…my task was, once again, to get my sorry, sick, humiliated self back together as quickly as possible. Because if I didn’t stand up and do a credible job of walking and talking, my license and job would have been up for grabs, and then how would I be able to tell if I was okay?” (8). I believe in metrics. I believe that one must be able to measure things (distance, time, growth, progress) in order to know change has occurred. In fact, I am constantly measuring and counting and comparing and assessing things, most of which have nothing to do with my mental health. (Although my need to measure makes that last part debatable.) I agree with Vonnegut in that I too use the ability to work as a metric for my okay-ness. I also use the extent to which I am trusted by others. It’s been suggested to me that not all things can be measured. It’s also been suggested that some things should not be measured. Question: How do you measure your okay-ness? If clear-cut metrics aren’t always a good idea, how do you know when you’re doing more or less fine? what a great article! Thank you for writing it. I do measure okness, but it is on a moment to moment and sometimes a day to day basis, no more than that. I do not have 100% faith that I will not fall back into the dump. I think I don’t care that other people think things like “can she really be ok?” It is my actions that tell the story. The main problem for me is I have no future. I live in the present (I know that is considered good by the buddhists and such) and that’s important, but I have nothing in front of me except the week, weekend, or possibly in a month. Sometimes the year. But I’m talking about future, like dreams, planning a life…I’m 44 btw. Just maintaining. That’s what we do. Meredith…I’m glad you enjoyed the post, and thank you for taking the time to answer the questions. Even more so, thank you for making me think about our personal temporalities. Until very recently, I’ve denied myself a past (see the Back to the Future post) and I have to work very hard not to deny myself a present. I practically LIVE in the future: plans, goals, benchmarks – these are my tools and my measurements, and I sometimes wonder whether it’s just coping or denial or optimism. We all have our ways, I guess, and this thought will percolate for a while. Don’t be surprised if it spurs a new post on the topic! Best, ∃.